Pier Paolo Pasolini’s last film was the infamous, and largely banned, Salò, or the 120 Days of Sodom. The controversial 1975 picture sees four Italian libertines in the last throngs of Mussolini’s fascist wartime regime. They kidnap eighteen youthful, attractive men and woman whom they sexually abuse and torment. The degraded youths meet a horrific demise as they’re branded, hanged and scalped. The libertines take turns looking on voyeuristically as the hostages’ eyes and tongues are removed. It’s safe to say Pier Paolo Pasolini wasn’t your average film director. An ardent communist, anticlerical activist, writer, intellect and gay man, Pasolini’s eccentric persona inspired many followers. One such admirer is Abel Ferrara, director of the biopic, Pasolini. The film is clearly a labor of love for him. Yet Pasolini only skims the vast ocean of its titular character’s life. 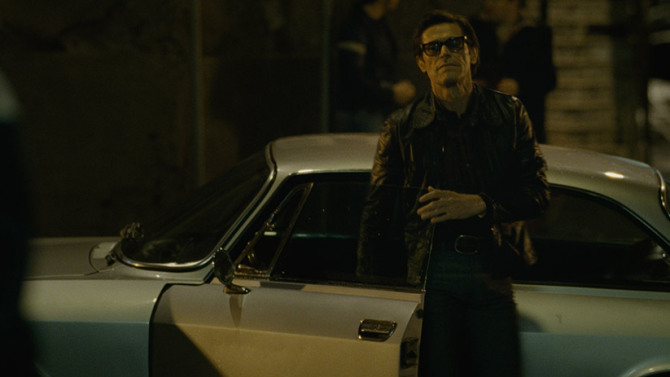 The film itself is beautifully directed and darkly brooding around Willem Dafoe’s remarkable Pasolini impression, but remains evasive about its subject’s true motivations. We’re introduced to Pasolini via a fragmented yet methodical montage of his complex world. The sequence features a voice over from Dafoe in his husky, purposely American accent, and is filled with clips of his debauched new release, Salò. In the brief seven minute collage, we learn much about Pasolini without actually knowing anything about who he is as a person. This storytelling paradox snowballs for all of Pasolini…. Read the rest of the review at Movie Fail.